Clients with Narcissistic Personality Disorder (NPD) are often reluctant to attend therapy and can be difficult to successfully treat. While this can be a rewarding process, it’s not without its challenges and requires a specific set of skills. 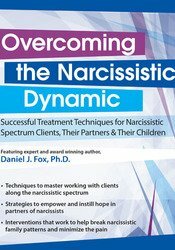 This treatment-focused recording will help you learn the skills to successfully work with, and manage, the narcissistic spectrum client, their partners, and their children. Working with partners in narcissistic spectrum relationships presents unique challenges that require specific therapeutic approaches and skills. This recording will help you gain those skills and maximize therapeutic sessions to lessen relationship difficulties and build resistance to narcissistic spectrum manipulations often seen in clients in narcissistic spectrum relationships. Children of narcissistic spectrum parents often present with unique and complex symptoms that disrupt therapeutic trajectory and keep them stuck in place. You can affect change in these individuals, you can help them overcome the burdens, guilt, and regret they carry with the tools and techniques learned through this recording. This unique, fun, and impactful recording will guide you through the process of treating your clients along the narcissistic spectrum, their partners, and their children! Create a treatment plan for better outcomes of clients along the narcissistic spectrum. Incorporate evidence-based techniques to address and change maladaptive patterns in your narcissistic spectrum clients, their partners, and their children. Develop skills to help your narcissistic spectrum clients, their partners, and their children learn adaptive relationship skills while minimizing maladaptive relationship pathology. Explore the factors that keep partners in relationships with narcissists and provide strategies for building resistance and resiliency against manipulative behavior. Differentiate between the different narcissistic spectrum parent types to improve treatment outcomes among their children. Develop effective assessment skills and clinical strategies for effectively treating children of narcissistic spectrum parents. New York Infectious Diseases: PESI, Inc. provider identification number IC128, is an approved provider who has been authorized to offer the mandated course work in barrier precautions and infection control measures. This entire course qualifies for credit under this requirement.